Wash the mussels two-three times to remove all the dirt stick on the shell. Place them in a wide vessel/Pot with water to cover the mussels and bring to boil with lid on. You will see the shell open and mussel leave the shell from one side and form shape instead of sticking on both sides of the shell. Separate the flesh from the shell and discard the shell. 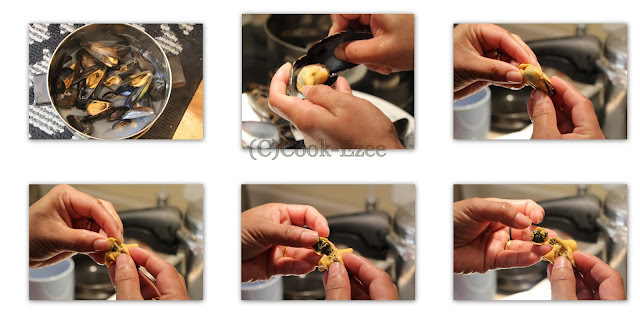 Remove the black color dirt inside the mussel meat. Remove byssus(a strong group of filament like hair) inside the mussels as well. Pour water in a bowl and put mussel meat in it. Rinse gently to remove any sand/dirt in the meat once or twice. Marinate with Salt, turmeric, chilly powder and crushed fennel seeds. Set aside for 30 minutes. Heat a tsp oil in a pan, place the mussels and shallow fry on both sides till they are light brown. Move them to a bowl and set aside. Pour oil in the same pan, add curry leaves, minced ginger and garlic and saute till raw smell goes away for a minute or two. Add Green chilies, sliced onions, salt and saute very well in medium heat till they turn translucent. Add tomatoes and saute till they start releasing water content. Break the tomatoes as you saute and let everything blend together well. Add turmeric powder, coriander leaves and saute well to mix. Add the shallow fried Mussles/Kallumakkaya and saute well to combine. Cover and let it cook for three-five minutes stirring occasionally. Add garam masala and more curry leaves, saute well, cover and let cook for another two-three minutes. Check for salt and adjust. Switch off the stove and set aside till you prepare rice. Wash rice three to four times in water till you get a clear water, drain the rice fully and set aside. Heat up a wide vessel, add ghee, saute the cashews till light brown and set aside. Add the raisins and saute till they pop up, take out and set aside. Now add cinnamon sticks, cardamom pods, cloves, pepper corns and saute well till you start getting a nice aroma of spices. Pour water to it, add salt, squeezed lime juice, few curry leaves and bring to boil. Add rice, stir gently with a spatula till the bottom of the pan just to remove any sticky rice from the bottom. Simmer the heat to medium, cover with an air-tight lid and let it cook until almost done. Open the lid once the water is absorbed(rice should not be fully cooked, but will continue to cook during the dum process) and take off the stove. Let it cool for couple of minutes, say around 10-15 minutes, if you try to flip or toss the rice when it is very hot it will tend to break and stick. Heat up a thick bottom pan, add 2 tsp oil(or ghee), simmer the heat to medium. Repeat the process with remaining rice, masala, fried cashews, raisins, onions and garama masala. Cover it with an air tight lid or place a kitchen towel flatten on top of the vessel and cover to seal tight with the lid. Cook in low heat until you see steam releasing from the sides of the vessel. Move to a serving plate, garnish with more raisins, cashews and fried onion. Serve warm with pappads, pickles and chutney. 1. 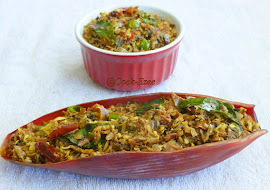 You can dum biriyani in the conventional oven the same way by layering rice and masala. Use a microwaveable tray and cover it airtight using the proper airtight lid or the heavy duty silver foil sheet. 2. If you look at the recipe, I've used very less chilly powder instead have added lot of green chilies where the spice comes in. If you want them more spicy you can add chilly powder or increase the amount of green chilies as this recipes is a medium spicy one. god !! soo tempting things..and there i am desperately trying to start dieting from today. :( and hey ! feel free to drop by my space too when you get the time. just posted on some handy parenting tips to "sane motherhood" on my "pick quicks" blog. Hope you will be a follower there as well. lets stay connected, beyond the kitchen. 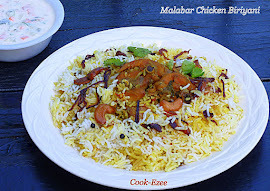 Mussels briyani, who can resist to it, inviting and droolworthy food. Wow, that looks amazing. bet it tasted great as well :-) I've never eaten Mussels biriyani , what a super idea! Yum! Thanks for showing us how to clean them. I'm not that adventurous! Ethuvere try chetitilla,new to me,drool worthy..will try this for sure.